Pictured above: The iceberg autonomous underwater vehicle (AUV) returns from a mission exploring the underside of an iceberg on a calm day in Petersen’s Fjord, Greenland. For more than 30 years, MBARI has been developing tools to study life in the extreme and remote environments of the deep sea. Those tools may also prove useful in the US space program as NASA looks for life and explores other worlds in the extreme environment of outer space. 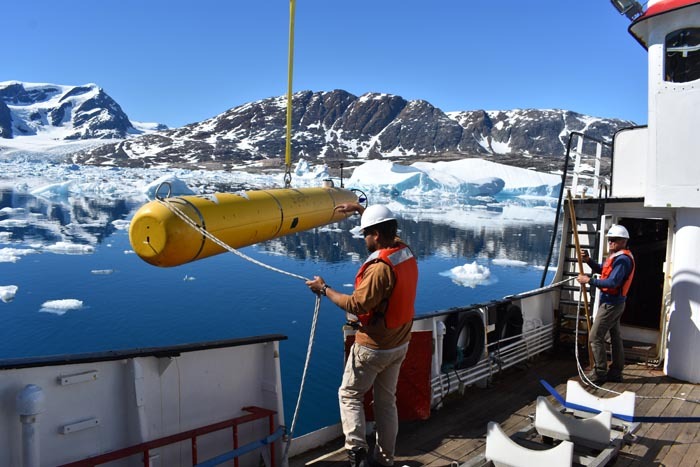 In 2017, a team of MBARI engineers contributed to that endeavor as it tested the latest development in autonomous underwater vehicle (AUV) technology among the icebergs of Greenland—proxies for much less accessible asteroids and planets. Engineering advancements in ocean science technology can help answer questions about life on Earth and on distant bodies, such as asteroids, beyond our planet. Using an AUV to map terrain is not new. In fact, working with several MBARI scientists, Engineer Dave Caress has produced stunning results using mapping technology developed in his Ocean Imaging Project to create meter-level (and better) bathymetric maps of deep-ocean sites in Monterey Bay and throughout the world. The goal of this Greenland expedition was to demonstrate a new mapping algorithm that extends this mapping capability to moving targets (for example, icebergs) plus a new control logic that enables an AUV to fly safely along unknown vertical surfaces such as the side of an iceberg or submarine canyon walls. The iceberg AUV was tested in the fjords outside Tasiilaq, Greenland. 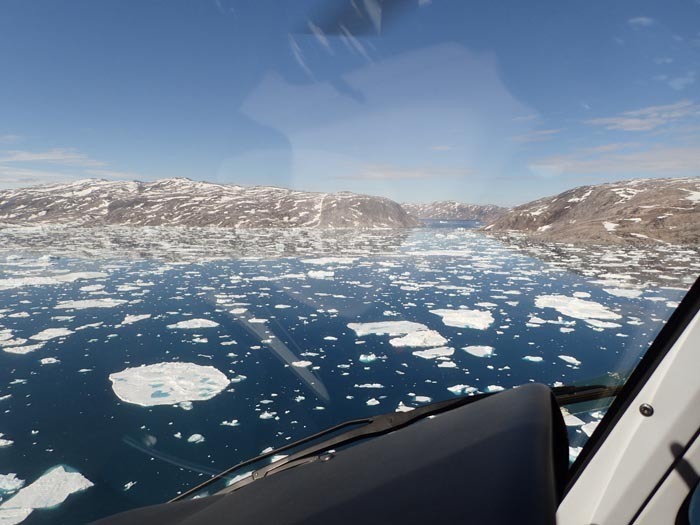 During a three-week summer expedition, MBARI researchers, along with team members from Stanford University, completed a successful expedition to map the submerged portions of icebergs in the fjords of Greenland using the new AUV system. This expedition was the culmination of a six-year effort funded by NASA’s Astrobiology Science and Technology for Exploring Planets program. NASA’s motivation for funding this project was to support the development and field demonstration of new technologies that could advance the state of the art in using autonomous robotic systems to explore remote and extreme environments in deep space in a quest for signs of extraterrestrial life. The space agency has funded such Earth-based missions in extreme environments to demonstrate such relevant technologies. MBARI’s work developing new mapping, control, and navigation techniques in the deep ocean and around free-drifting icebergs was an excellent match for these goals. 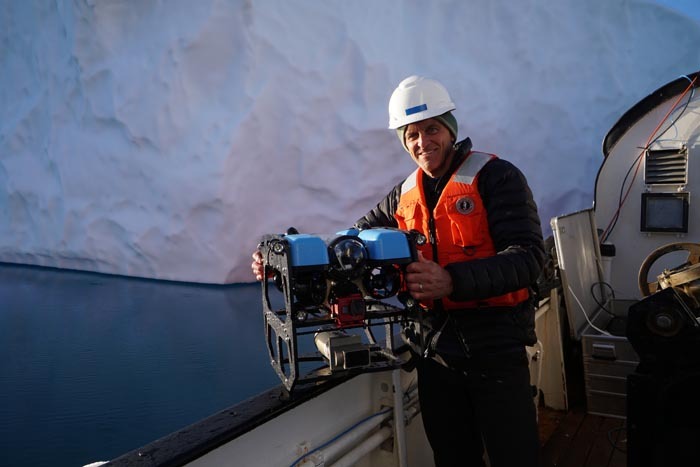 The motivation for the MBARI team began with the creation of an AUV-based sampling system to support research on the impacts of icebergs in the Southern Ocean as “ecological hotspots” of activity. 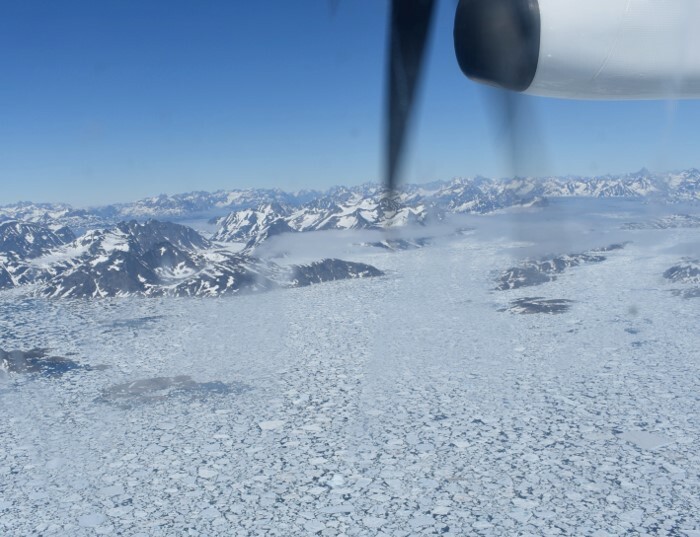 More broadly, however, this Greenland project directly supported MBARI’s long-term goal of enabling autonomous vehicles to monitor and sample the deep ocean. This project demonstrated the feasibility of using AUVs to navigate safely along and map complex terrain such as vertical canyon walls. In fact, in preparing for the Greenland expedition, multiple missions were run along deep canyon walls in Monterey Bay to test the new technology. 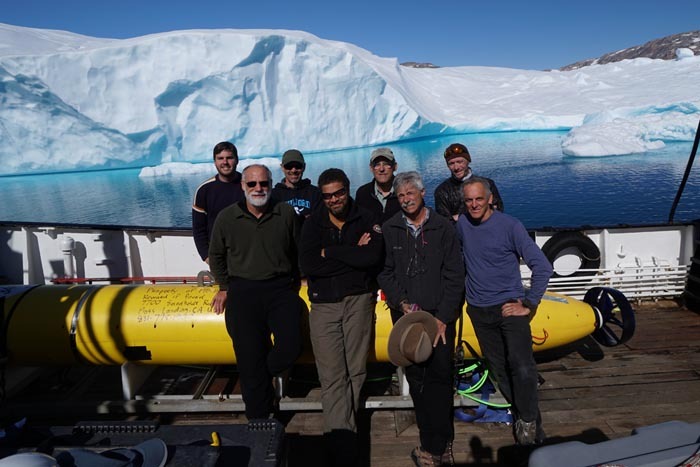 The iceberg AUV is tested in Monterey Bay prior to the Greenland expedition. The iceberg AUV, as it came to be known, is similar to MBARI’s D. Allan B. seafloor mapping AUV in that it is a Dorado-class vehicle equipped with a mapping sonar that can collect profiling data required to construct the shape of the terrain or target. The configuration of the mapping sonar (red) and the obstacle avoidance sonar (blue). Both AUVs can also collect backscatter data to identify marine life in the water column. The unique aspect of the iceberg AUV is that its mapping sonar and its Doppler Velocity Log (DVL), which measures the AUV’s velocity with respect to the targeted terrain, can be rotated to point to the side, up, or down. It is also equipped with obstacle-avoidance sonars. 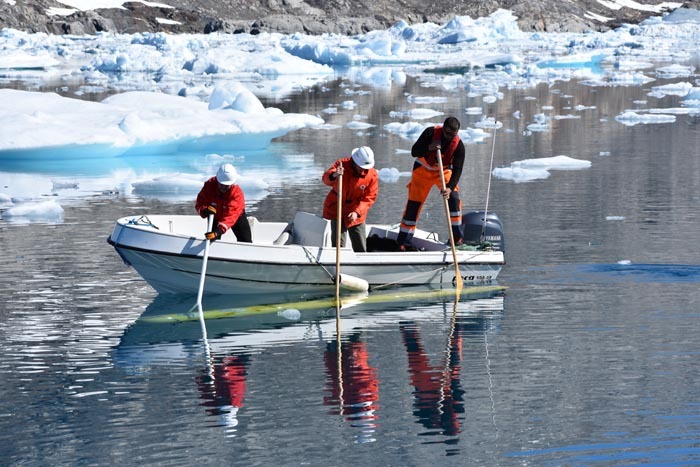 In addition to the sonars, the iceberg AUV carries a suite of science instruments that can characterize physical, chemical, and biological properties of the surrounding water. In addition to the AUV itself, new navigation and control logic was developed that couples an obstacle-avoidance algorithm with a reactive wall-following algorithm to achieve safe flight of the vehicle as it follows along complex vertical surfaces. Significantly these new navigation techniques do not rely on established infrastructure such as GPS or calibrated acoustic networks and can provide “drift-free” navigation even when using relatively low-cost sensors. MBARI Adjunct and Stanford University Professor Steve Rock tells about the purpose of the new iceberg AUV, and the successful mission to Greenland in 2017 to test the new vehicle. 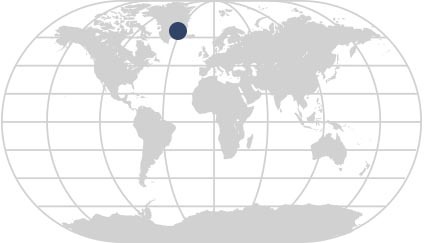 The expedition began in Tasiilaq, Greenland, where the team waited four days for the ship, the R/V Adolf Jensen, to work its way through the large ice field off the southern coast of Greenland. 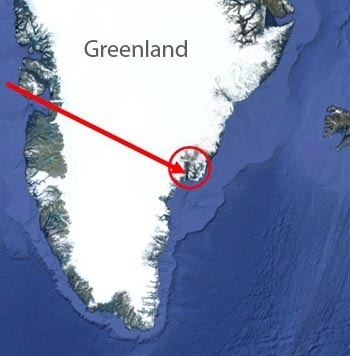 Once the team was on board, the ship took three days to make its way through ice fields on the way to Petersen Fjord, a total distance less than 64 kilometers (40 miles). They then had a full eight days to work in near-ideal conditions with deep, calm water and several large icebergs nearby. After three days of initial tests to be sure all systems were operating, the team spent the next five days mapping icebergs. The ice field south of Greenland. During a typical mission, a crane would launch the AUV over the side of the Jensen. 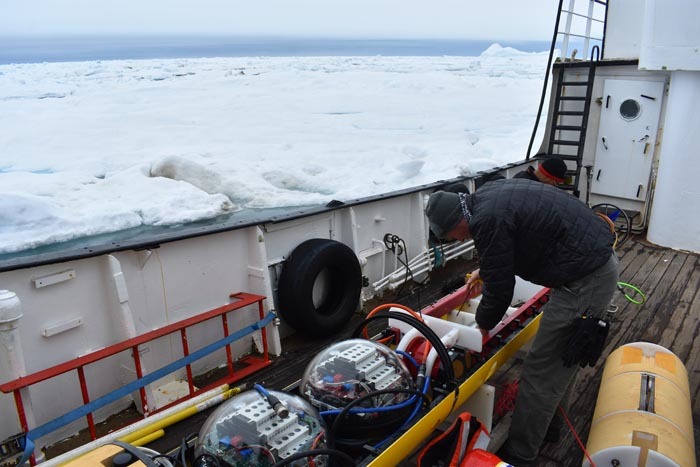 For the first dive at each iceberg, a small boat towed the AUV around the berg to perform a functional checkout of the AUV as well as to collect a preliminary set of sonar data that was analyzed to be sure it was safe to operate near the berg. On subsequent dives, a small boat towed the AUV to its starting point several hundred meters from the iceberg. The AUV was then commanded to dive and, from that time on, it operated in a fully autonomous manner. Using a crane to deploy the iceberg AUV from the R/V Adolf Jensen. The vehicle was programmed to first fly in the general direction of an iceberg. Once its sonars detected the iceberg, it switched into a wall-following mode and made multiple circumnavigations of the iceberg at multiple depths. As it flew, its obstacle-avoidance sonars provided information to the AUV’s control system to maintain a constant standoff distance from the iceberg’s surface, as well as to detect and avoid any iceberg protrusions or any other obstacles in the AUV’s path. An onboard acoustic instrument (DVL) also recorded the AUV’s speed with respect to the iceberg’s surface, key for processing the data after a dive. During its flight, the AUV’s science instruments and side-looking mapping sonars also collected data that would be fused into a map of the iceberg after the dive was completed. The AUV resurfaced at the end of each programmed dive, to be retrieved using a small boat. After each dive, the science and sonar data were downloaded from the AUV for processing by the newly developed mapping algorithm. 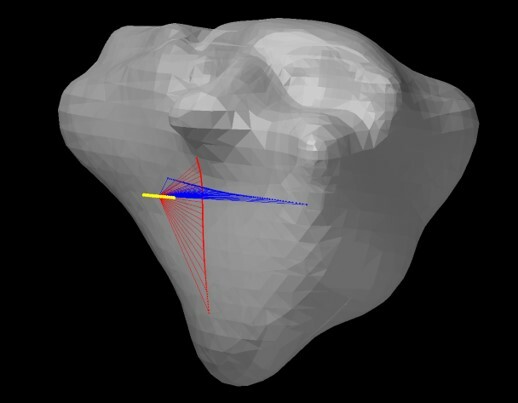 The novelty of this algorithm is that it reformulates the navigation problem into an iceberg-relative frame of reference in a way that eliminates the need to measure or solve for the iceberg’s motion. The result is that a map of the iceberg is created and all sonar and science data are registered in this map. An iceberg in Petersen Fjord, with the AUV for scale. 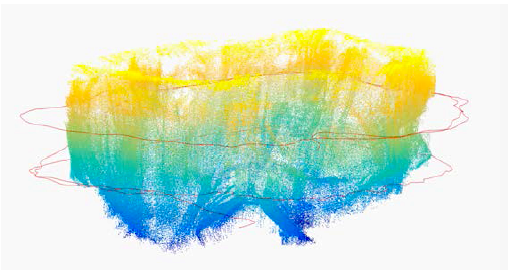 Sample sonar point cloud and mission profile of the AUV showing circumnavigations at depths of 50 meters, 100 meters, and 150 meters. The colors indicate depth. A typical iceberg in Petersen Fjord is approximately 250 meters in diameter and 180 meters maximum depth. During this mission, the AUV circumnavigated the iceberg at depths of 50 meters, 100 meters, and 150 meters. The resulting point cloud of sonar points, combining all three depths, is also shown in the figure. By the end of the expedition, 15 production-run dives were done on three icebergs. The same dives were run more than once to provide some measure of the ability to repeat dives and the accuracy of the mapping techniques. This project advanced the use of AUVs to collect science data, which is at the heart of MBARI’s mission to assess, characterize, and monitor the physical, chemical, and biological makeup of deep-ocean sites. For NASA, the results of this project can help motivate and guide the development of new algorithms applicable to the exploration of such places as the oceans beneath the frozen ice of the Jovian moon, Europa, or to do precision mapping of asteroids or other deep-space bodies that are potentially tumbling through space. Whether it’s the deep sea or outer space, the steady improvements throughout the history of MBARI’s AUV program demonstrate that good engineering has the power to answer some of the biggest questions about our planet and beyond. AUV Engineer Erik Trauschke works on the iceberg vehicle on the deck of the R/V Adolf Jensen between missions. MBARI sensors on profiling floats record variations in ocean chemistry related to climate change.